Both of these recordings were very well made for their era, and in both cases I was able to work from excellent transfers. That said, the originals sounded slightly veiled to modern standards, and I've endeavoured to lift this as best I can with a gentle application of XR remastering. The results bring even more life and vivacity to music which is often already bursting with vigour, and sound truly splendid. Darius Milhaud was born in Aix-en-Provence in 1892 and first became famous as a member of the Parisian group of composers in the 1920's known as "Les Six." He embraced their ideal that music should benefit from folk-art, and he succeeded in a straightforward, undogmatic music that is at its best in his smaller works. It is important to note that these four seasonal concertinos were written at widely different times and together represent at least three different "periods" of the composer's art. The number of soloists and the variety of orchestral accompaniment mean that the four concertinos can scarcely be heard in succession except on record. The "Concertino de Printemps" was composed at Aix-en-Provence in 1934. In this short work for violin and small instrumental ensemble, we can imagine that Milhaud's polytonal and polyrhythmic skill enabled him to evoke with the greatest ease the innumerable tremors and tensions by which Nature signals its renewal. During the German occupation, Milhaud took refuge in America. A Californian foundation, Mills College, offered him a chair of composition and it was there that Milhaud composed the "Concertino d'Eté" and the "Concertino d'Automne" in 1951. The first is for a solo viola and wind group with cello and double-bass. The music is at first "supple and lyrical" but the veiled languor of the viola is disturbed by lively interruptions from the wind instruments. A dance rhythm and the increasing crudeness of the colours make the exchanges extremely animated. The second was written for the famous piano duo Gold and Fizdale, to whom it was dedicated. The eight instruments accompanying the two pianos are flute, oboe, three horns, two violas, and cello. To begin with the atmosphere is heavier here, being dominated by the lower register of the horns. Then the woodwinds introduce a freer episode which, between the flute, piano, and strings, turns into a divertissement. The "Concertino d'Hiver" was written in September 1953 aboard a ship on which the composer was once more crossing the Atlantic. Commissioned by an American foundation, the work is scored for trombone and strings and was first performed in the spring of 1954. Again, Milhaud tries to detach himself from the clichéd expressions generally bound up with the evocation of the seasons, and he chases away the classic winter fogs by beginning boldly with some cheerful capers from his unexpected soloist, the trombone. The Portuguese word saudade is defined as "an ardent longing for an absent thing" The suite, originally for piano solo, was begun in Copenhagen in 1920 and was completed in Aix in the following year. Six of the twelve movements were orchestrated for the dancer, Loie Fuller; later Milhaud orchestrated the other six and added a little overture that is not to be found in the original version. I was fascinated with the rhythms of this [Brazilian] popular music. There was an imperceptible pause in the syncopation, a careless catch in the breath, a slight hiatus which I found very difficult to grasp. So I bought a lot of maxixes and tangos and tried to play them with their syncopated rhythms, which run from one hand to the other. At last my efforts were rewarded and I could both play and analyze this typically Brazilian subtlety. One of the best composers of this kind of music, Ernesto Nazareth, used to play the piano at the door of a cinema in the Avenida Rio Branco. His elusive, mournful, liquid way of playing also gave me deeper insight into the Brazilian soul! Memories of the maxixes and tangos, of the carnival festivities at which they were used, and of the playing of Nazareth (who also taught and inspired the young Villa-Lobos) provide the nostalgic background and imaginative substance for Saudades do Brasil. One of those recordings where you can almost picture the location of the players without its coming off as overproduced. It might seem odd to refer to Darius Milhaud as a “difficult” composer considering that he wrote such easy-to-digest music as Le Boeuf sur la toit, La Création du monde, the Suite provençale, Suite française, Scaramouche, and Saudades do Brasil—tuneful, colorful pieces spiced with “wrong” notes—but they are typical of his output only in their relative brevity. Milhaud reputedly advised Burt Bacharach not to “be afraid of writing something people can remember and whistle. Don’t ever feel discomfited by a melody.” In the sense that his music is full of melody, it could be said that Milhaud took his own advice, but, very often, the melodies are absorbed into dense, busy counterpoint, with more than one tune playing at the same time and often in different keys (polytonality), even major and minor ones at the same time (polymodality). When he isn’t writing in his popular style, his music requires serious and, sometimes, repeated listening. Sometimes, repeated hearings will enable a listener to “get” a piece, but there are no guarantees; there are going to be pieces that one will never like no matter how many times one listens to them. Given a composer who compiled more than 440 opus numbers, this shouldn’t be surprising. I suspect all of us harbor at least a modicum of suspicion toward prolific music machines like Milhaud, Hovhaness, Reger, and Villa-Lobos, who could apparently crunch it out by the sheaf. After all, if Mozart wasn’t “on” 100 percent of the time, why should we expect them to be? Milhaud apparently had such technical command that he could dash off a string quartet in a few hours, with a power of concentration that enabled him to ignore distractions. Although Milhaud eventually lumped them together as if they constituted a single work, the four concertos that make up The Seasons are not really related to each other; they are individual pieces and should be listened to that way. The Concertino de Printemps, reputedly Milhaud’s favorite of the four, was written for violinist Yvonne Astruc and composed much earlier than the others. If it actually was Milhaud’s favorite, I can understand that, for it’s a cheerful, busy, light-textured workout for the violinist, who is playing nearly all the time. Fortunately it, like the other three, is not a long piece, running 8:44 in this performance by Szymon Goldberg and the composer. The late Mitch Miller used to call concertos of this kind, that give the soloist little rest, “tapeworms.” Even so, I had to listen to the piece nearly a dozen times before it clicked. That’s why I think one should not listen to these little concertos one after the other; they are dense, highly contrapuntal pieces that are not easily digested and, of course, there’s no guarantee that you’ll like them any better after the 12th hearing. That, in fact, is what happened to me in the case of the Concertino d’Été. Like the others, it has no apparent connection with the season (summer, in this case) in its title and, like the others, keeps its soloist, in this case violist Ernst Wallfisch, quite busy. Somehow, my mind kept wandering as the notes flew by. It struck me as the kind of piece that would be great fun to perform but less fun to listen to. It is also the longest of the four, coming in at 13:27 in this performance. The Concertino d’Automne for two pianos and orchestra was written for the team of Gold and Fizdale but is performed by two French pianists on this recording. Here, the sonority is uncharacteristically thick to the point where it’s difficult to keep up with what’s going on. There are passages where one pianist is pounding away on the melody while the other plays showy octave runs and arpeggios. There are times when the pianists seem to be producing tone clusters. The Concertino d’Hiver has a certain fascination since it’s a rare concerto for trombone; in fact, the only other one I can think of (though I’m sure there are others) is by Nathaniel Shilkret (there’s a pirate Tommy Dorsey/Stokowski recording of it). Once again, the soloist is kept busy and must deal with Milhaud’s apparent affection for writing in the extreme ranges of instruments. Its three movements are played without pause. The second, slow movement has the trombonist playing with a mute. Since I heard no slides at all, I wonder if Maurice Suzan was using a valve trombone. Like the other three concertos, the piece ends abruptly. Trombonists can use all the concertos they can find, and here’s one that would spice up a program without wearing out its welcome. 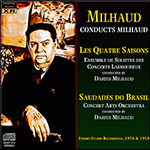 In the case of the Saudades do Brasil, we hear Milhaud writing in his crowd-pleasing “popular” style. Originally written for the piano, it was inspired by a year Milhaud spent in Brazil as an assistant to Paul Claudel, who was, at that time, the French ambassador. Milhaud later arranged it for piano trio and, when it was used as a ballet, for symphony orchestra. The 12 pieces portray Milhaud’s impressions of various neighborhoods in Rio di Janeiro as well as a few places outside the city. When he orchestrated it for choreographic use, he added an overture. He also reversed the order of Paineras (No. 9) and Sumaré (No. 10). The orchestrated version had previously appeared on CD in a recording by the Basel Chamber Orchestra under Johannes Schläfli, but he omitted Sorocaba (No. 1) and Leme (No. 3), and reversed the order of Larenjeiras (No. 11) and Paysandú (No. 12), apparently to get a flashier ending. Fortunately, its absence from the catalog is now academic with the reappearance of Milhaud’s far superior performance and recording. It’s one of those recordings where you can almost picture the location of the players without its coming off as overproduced. This article originally appeared in Issue 34:6 (July/Aug 2011) of Fanfare Magazine.